Rocks are a natural hardscape that you can use for a variety of landscape solutions from decor to paths and retaining walls. From small stones to large boulders, the central Texas area is full of rock. If you live west of I-35, especially in the Leander or Lago Vista areas, chances are good there’s a lot of rock on your property. Here are 5 ways to take advantage of the rock you already have, or how to incorporate natural rocks into your landscape for a more native design. 1. Use large boulders and rocks to make a change in elevation more fluid or to break up a larger space. Natural rock retaining wall designed by Best of Texas Landscapes. 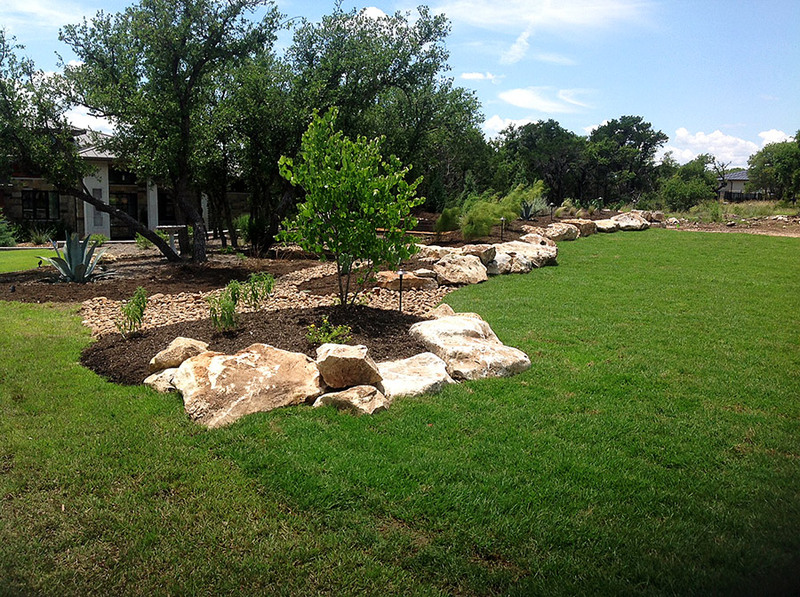 Natural rock landscaping designed by Best of Texas Landscapes. 3. Use a mixture of rocks and flower beds to spice up your look with added texture and height variances. 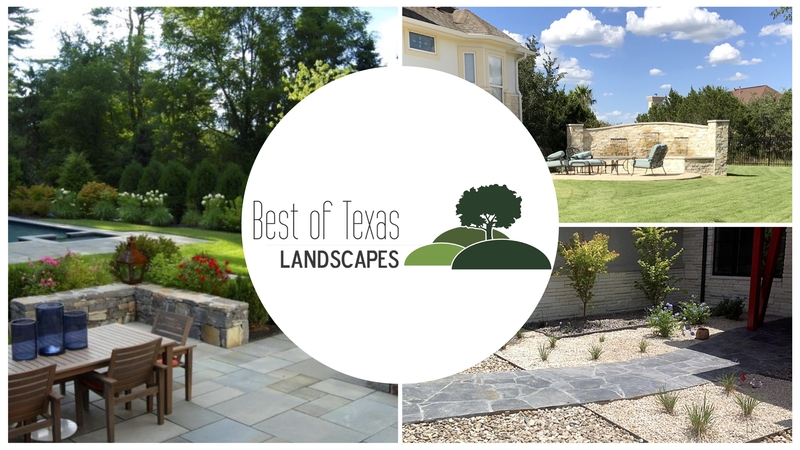 Flower beds and retaining walls designed by Best of Texas Landscapes. Flower beds and borders designed by Best of Texas Landscapes. 4. Use a combination of rocks to create a harmonious xeriscape for an easy maintenance solution. 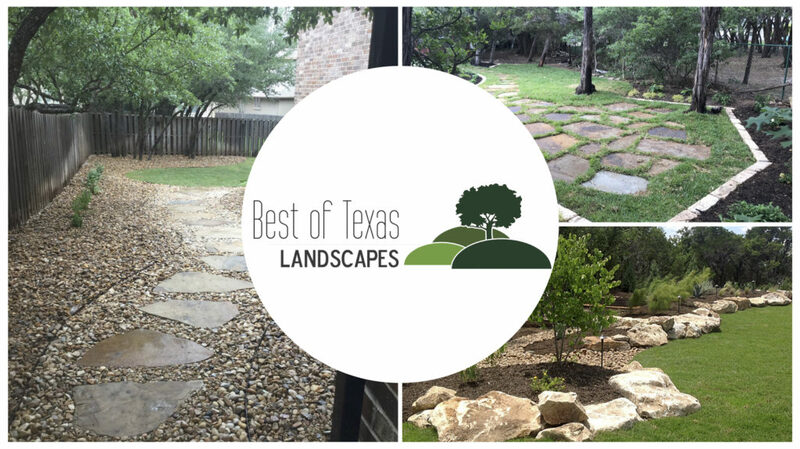 Paths and walkways of gravel and stone designed by Best of Texas Landscapes. 5. Use large flat rocks to create a gorgeous staircase or walkway. From large rural spaces to smaller urban areas, natural rock hardscapes are a popular look that can be used for functional and decorative solutions. What can we design for you? Contact us here to get a complimentary consultation. 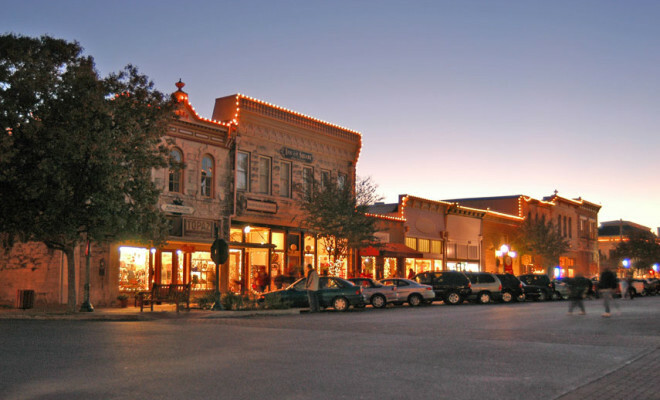 Georgetown, Texas is nestled in the Texas Hill Country alongside the San Gabriel River and Lake Georgetown. It also happens to be one of Austin’s fastest growing suburbs. While Georgetown’s thriving retirement communities, like Sun City, have influenced its recent growth, it is attracting more up and coming neighborhoods and golf communities like Cimarron Hills. Even with all the amenities of living in the city nearby, there are plenty of places to slow down and enjoy the scenery. You can stroll the grounds of the Town Square Historic District or Southwestern University—Texas’ oldest university. Take a dip in the Blue Hole or explore the 27-mile Good Water Trail around Lake Georgetown. Creeks and streams are common, stemming from the north and south forks of the San Gabriel River. 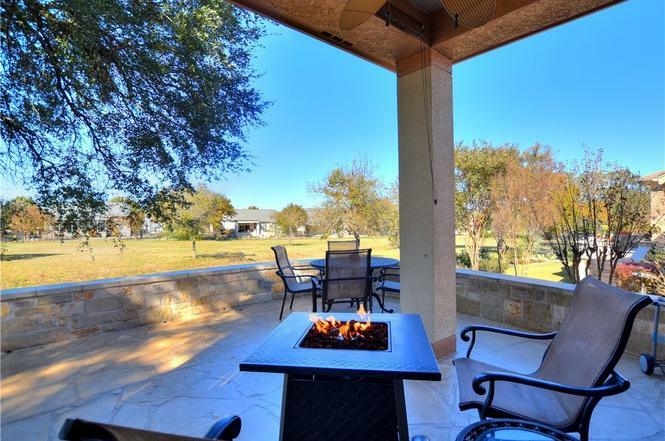 Combined with the temperate climate of central Texas, homeowners enjoy lush landscapes almost year-round. It’s no wonder outdoor living spaces made for comfort and relaxation are trending commodities in the area. What does an outdoor living space made for R&R look like? #1 Make it maintenance light. If you’re designing a front or backyard to relax in, you probably don’t want to be constantly reminded of all the weed-eating that hasn’t been done, or watering that one patch of grass that just won’t take. Tell your landscape designer you need something that’s easy to maintain. This doesn’t mean you’ll have to skimp on looks. Try incorporating indigenous plants, hardscapes and other outdoor elements like water features. Choose a sprinkler system that makes it easy to set it and forget it! Modern systems (like our Rain Bird and Hunter products) can give you full control of water usage so you can water more in sunny areas and less in shaded ones. Make sure your outdoor space can be enjoyed no matter the weather! Aside from the random storm and the rare freeze warning, this will ensure you can enjoy your investment nearly every day. Build a shade to create cover from the sun and rain. You probably don’t want to sit in the rain, but wouldn’t it be nice to enjoy a cool spring shower, rocking under the protection of a canopy or awning. Stay cozy by the fire. While a shade will protect you from the harsh summer sun, including a firepit or outdoor fireplace will help you stay comfortable outside through our coldest months. #3 Build a patio and walkway. Have you ever noticed a tendency to only stay on the porch or hard surfaces of your yard? It’s a common inclination as we seek level land for balance and prefer ground that doesn’t leave our shoes a muddy mess. Permanent ground cover could be in the form of a patio or porch, using cement, rock or wood. This is the best area to consider when planning your outdoor seating needs and furniture options. More transient surfaces like large stones, pavers and pebbles or gravel can be used for paths and walkways to combine complementing elements and add more appeal to your overall design. #4 Light up the night! The perfect combination of outdoor lighting, accent and/or security lights can help create the ideal ambiance you’ll need to go from blah to bliss. To truly make your outdoor space an extension of your home, shed some light on the subject! Enjoy more engaging conversation, and light to read or play games by. Create eye-catching focal points with security and accent lighting to feel more at ease and aesthetically pleased! At this point, you might be thinking, that all sounds great, but also like a lot of work…and I want to relax! Don’t worry. We’ve got you covered. One of the great benefits of hiring a design-build firm for your outdoor renovation is that we handle it all. Our team of proven professionals is the easy-button solution to creating your new landscape and a yard you’ll love. We design it, build it, and install it – from foliage to masonry to sprinkler systems! Learn more about the advantages of hiring a design-build landscape firm here. Are you a new or soon-to-be homeowner in the Georgetown area? Here are a few links you might find useful! In Central Texas, designing a beautiful landscape can often mean enhancing the natural elements that Texas has already given us. However, with a lush native landscape and a fairly mild climate, we’re also able to enjoy plants from many regions. With so many options, it’s important to consult with a professional landscape designer. A seamless design connects your home’s interior to its exterior, increasing your overall living area. By hiring a professional, you can transform the look and appeal of your outdoor space to make your yard more functional and inviting. First things first, you need to have a plan before you begin shopping for plants, pavers and other items to redo your outdoor space. A landscape designer can help you create a design plan that fits your budget and meets your goals, so you can choose materials and plants according to functionality and your design aesthetic. Then, you’ll have a realistic idea of how much your project will cost, how long it will take to complete, and what your ultimate vision will look like. Central Texas is home to just about every kind of terrain you can think of, from rolling hills to vast fields, groundwater, layers of rock, red clay and lots of cactus. 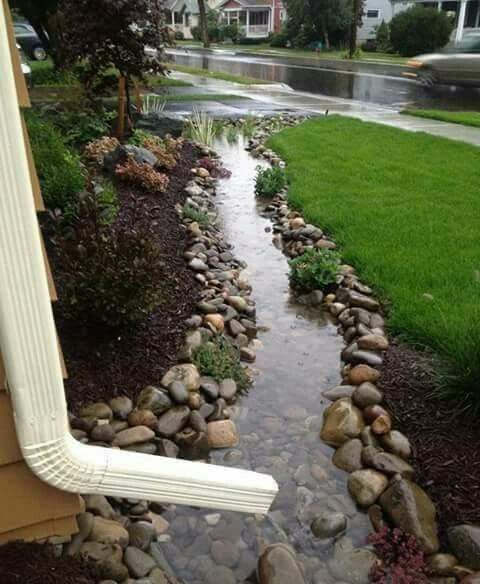 If drainage is an issue on your property, that will need to be addressed before the installation of plants or hardscapes. If your home faces north, you’ll need to plan for blasts of cold air and a lack of direct sunlight. Understanding what your challenges are will help you build a realistic plan for construction. 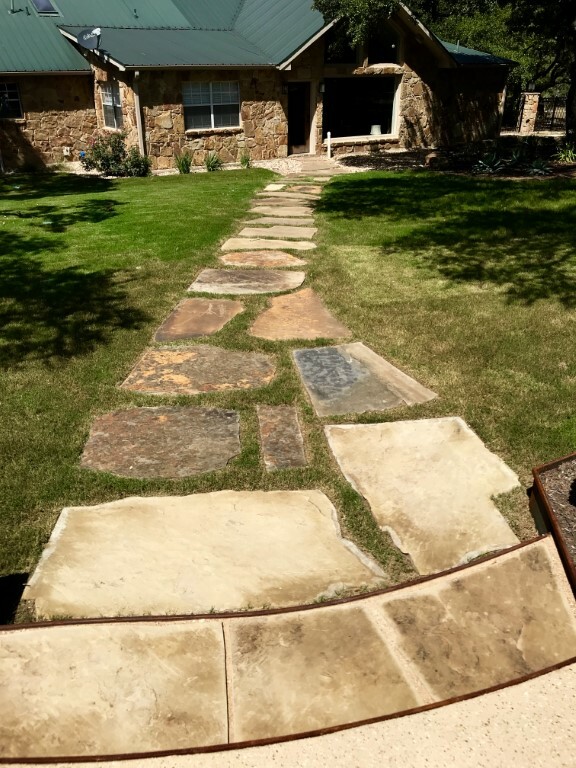 Some places around the Austin area, like Lakeway or Lago Vista for instance, are very rocky, and may require more time or added equipment to complete certain projects like a deck or fence installation. Visualize your outdoor space as an extension of your home, so that each individual space flows seamlessly to the next. Knowing how to best utilize your space will help you place plants accordingly. Decide if there are any kinds of functional spaces you’d like to include, where they should go and what needs to be built. That will help you identify where you need specific elements, like added privacy for a yoga or meditation garden. Even if you’re planning to spread your project out over time, it’s important to have a plan based on one grand vision. This will help you stay on track toward your goal and save you time and money. Instead of back-tracking and changing newly installed elements, build towards that grand vision so elements installed now will complement those installed later. Before you begin installing plants or constructing design elements, make sure your project is executed in a logical order. If you need a new sprinkler system, that needs to be done before you install new sod. Remodeling your front and back yards? Start in the back so you don’t hurt the front yard with contractors trying to access the back. By planning to install in logical steps, you won’t waste time and money by damaging new or existing designs. 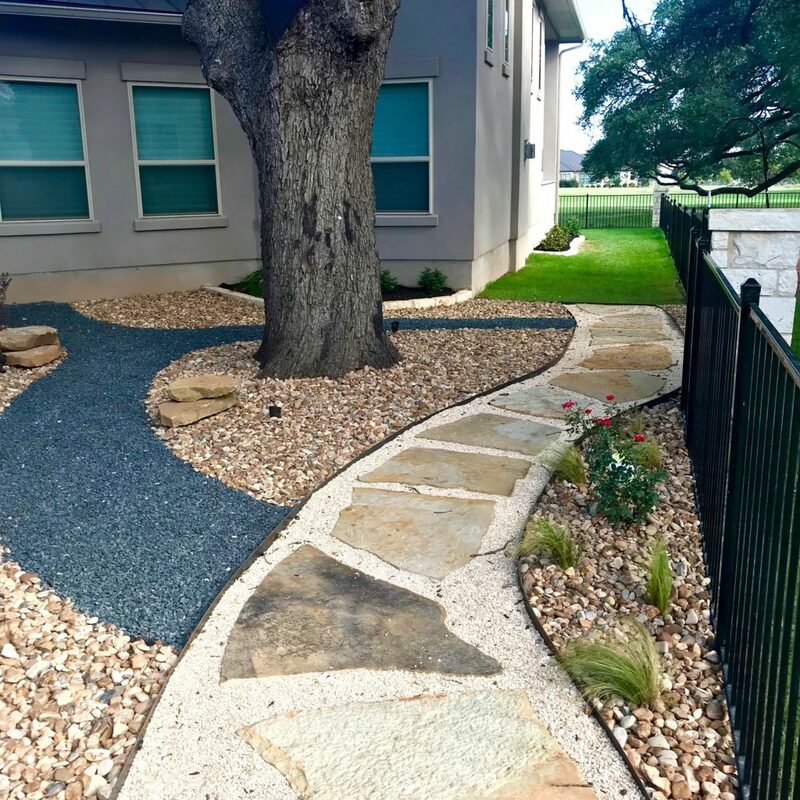 Now that you know why you need a landscape design and what to plan for, our next installment will go over different landscaping elements to consider for your project, and which backyard designs are trending in the Austin area.